Irish lamp features a reverse painted shamrock motif; it is an ideal size for a desk. The shamrock design, on this Irish lamp, is hand-painted on the inside of the glass shade. 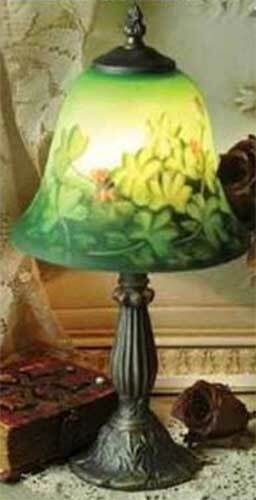 The glass shade on this Irish lamp features an all over shamrock design that is hand painted in various shades of green. The shamrock lamp would be ideal for a desk it stands 15" tall, with the included metal base with a bronze finish. The Irish lamp is boxed with a shamrock history card, complements of The Irish Gift House. The reverse painted Irish lamp is imported, minor assembly required. Irish lamp is a stained glass design that features and all over bouquet of shamrocks. Shamrock lamp is a stained glass Irish design that is ideal as an accent or desk lamp. Irish lamp features the Claddagh icon, crafted with stained glass in the Tiffany style. Irish lamp features a Celtic stained glass shade that is expressed with the Trinity knot on each side. Irish lamp features stained glass Trinity knots.